We recently came across a fantastic new book by Noah Horowitz. Formerly the director of the online VIP Art Fair, Horowitz was appointed the director of New York City's important The Armory Show art fair this week. Earlier this year, his highly educational book "Art of the Deal: Contemporary Art in a Global Financial Market" was published by Princeton University Press. Art today is defined by its relationship to money as never before. Prices of living artists' works have been driven to unprecedented heights, conventional boundaries within the art world have collapsed, and artists now think ever more strategically about how to advance their careers. Artists no longer simply make art, but package, sell, and brand it. Noah Horowitz exposes the inner workings of the contemporary art market, explaining how this unique economy came to be, how it works, and where it's headed. He takes a unique look at the globalization of the art world and the changing face of the business, offering the clearest analysis yet of how investors speculate in the market and how emerging art forms such as video and installation have been drawn into the commercial sphere. 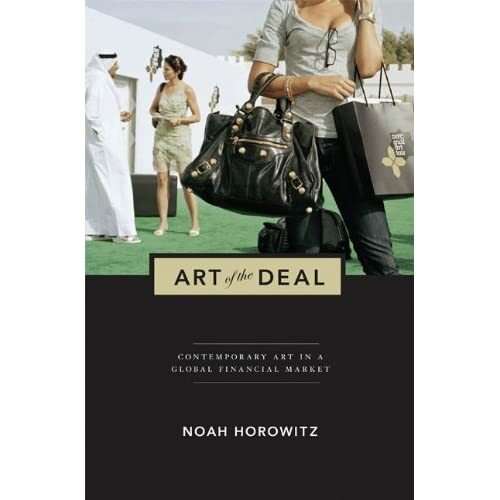 By carefully examining these developments against the backdrop of the deflation of the contemporary art bubble in 2008, Art of the Deal is a must-read book that demystifies collecting and investing in today's art market. Noah Horowitz is an art historian and expert on the international art market. He has edited and contributed to publications on contemporary art and economics for institutions including the Serpentine Gallery, London; the Astrup Fearnley Museum of Modern Art, Oslo; and the United Kingdom's Intellectual Property Office. He received his PhD from the Courtauld Institute of Art, London, and currently lives in New York, where he is a member of the faculty of the Sotheby's Institute of Art and director of the VIP Art Fair.